Is Anthony Joshua – The Real Deal? By Jamie Fairclough: Last night Anthony Joshua (9-9-0) absolutely destroyed a tough and durable fighter in Denis Bakthov (36-24-10) from the first bell of the fight to the moment referee Ian-John Lewis stepped in and stopped the fight Joshua had Bakhtovs number nailing him with a a lot of big shots. What was truly scary was the power Joshua was putting into these shots, he looked fast and speed plus power is a frightening combination, add into that the fact Joshua seemed to be timing his shots nicely all adds up into an impressive performance. 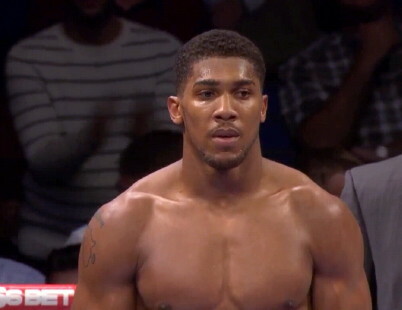 We saw a side to Anthony Joshua last night that hasn’t been there up until now, and that’s a spiteful streak, this caused him to smile whilst dishing out the punishment, he will need that streak in him when he comes up against an opponent who can punch back and land a hard shot on him. Now Eddie Hearn seems intent on building towards next year matching Joshua with British heavyweights Tyson Fury, Dereck Chisora and David Price the last of whom was last night at ringside and when Hearn mentioned this match up, despite saying to the cameras that he would relish the fight it was written all over his face that he knew Joshua could cause him serious problems. Price although chinny is a fighter and if he was matched up with Joshua he would meet it head on as the fighter In him would take over however I believe it would be in vain as unless he gets rid of Joshua with his first punch, he will have to take one and Joshua has the kind of real power that could see him knock price out in one punch. Chisora on the other hand has shown he has a real decent chin, going 12 rounds with Vitali Klitchsko and only being stopped by David Haye (himself a massive puncher) with his bobbing and relentlessly coming forward style would provide more of a test, on I still feel Joshua would win by knockout but might get in a few licks of his own first. Finally that brings me to Tyson Fury, again he has been knocked down by the light punching Steve Cunningham, however he displayed heart to get up and win. Like Joshua he is big and strong, but nowhere near as athletic and he doesn’t possess the same power. He does however have decent skills as a heavyweight even if his punches are more slaps sometimes. Like the other two fights I could see Joshua winning this by a mid to late knockout. I haven’t included David Haye as Eddie Hearn is realist and he knows Haye possesses the knockout power to hurt his man and I don’t believe he would go through with his bluff that he see’s them fighting next summer. Make no mistake Joshua is the real deal and could get near or surpass Lennox Lewis’s achievements but it will take time and its going to be an interesting road. Boxing » Anthony Joshua » Is Anthony Joshua – The Real Deal?